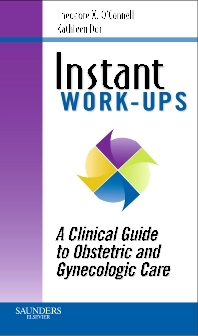 Instant Workups: Clinical Guide to Obstetric and Gynecologic Care, by Theodore X. O'Connell, MD, is a portable pocket resource and quick refresher that helps you develop and refine your diagnostic skills. Practical and easy to use, it provides clear workup plans for the most common obstetric and gynecologic conditions, providing you with quick, focused guidance with the flexibility to adapt to each unique patient. Topics are organized alphabetically and cover the signs, symptoms, and abnormal lab readings for each condition. Replace information taken from memory or multiple references with one concise, indispensable book so you can make accurate diagnoses in less time! Covers the most commonly encountered obstetric and gynecologic conditions to provide you with a practical and useful manual for daily practice. Reflects how a patient actually presents by organizing alphabetically by presenting sign, symptom, or lab abnormality. Includes a brief background discussion on each topic, followed by lists of important related materials (such as medications that may contribute to each condition) and laboratory and/or radiographic tests to be ordered. Describes each diagnostic test so you can refresh or familiarize yourself with the purpose of the test. Provides a sound framework for building your workups using detailed treatment algorithms.